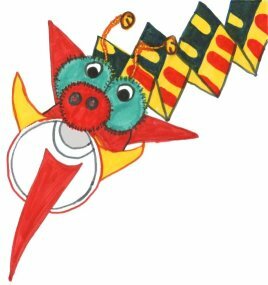 Materials and instructions to make your own dragon puppet for the Asian New Year. When your dragon dries, hold his head under his chin, when you walk his tail will fly like a kite! All materials came from a craft store or grocery store. 1 red plastic "Solo" cup, 16 oz. Glue 2 same color pom-poms to the cup at the end near the bottom, on the side of the cup. Put eyes close together. Add 2 plastic jiggly eyes to the pom-poms. Put another pom-pom at the other end of the cup parallel to the eyes near the opening of the cup. Glue two silver disk sequins on the nose for nostrils. Cut, then glue two yellow triangles on both sides of the nose. The horns should hang off the end of the cup. Punch two holes in the bottom of the cup. Thread one pipe cleaner threw the holes so they stick out behind the eyes. Add one bell to each pipe cleaner end. Bend the pipe cleaner end down to hold the bell on tight. Take a pencil and twist the pipe cleaner around it to make these horns curly or crazy. Cut, then glue the red felt tongue to the inside of the cup. The tongue should be hanging way out of the mouth. Cut then glue two red felt triangles for the ears. Place them on top of the pipe cleaners (push the pipe cleaners up against the cups bottom.) The ears should stick out to the side under the eyes. 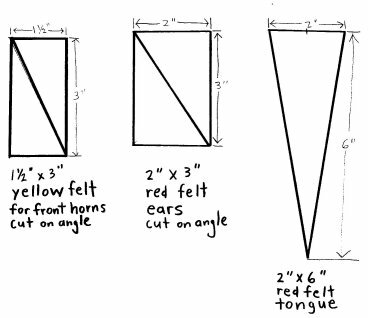 Measure and cut the tail out of colorful wrapping paper. Fold the tail in half the long way so the colorful wrapping paper shows on both sides. Lightly glue the two sides together. Fold the tail accordion style about every 3 inches. Glue one end to the bottom of the cup over the felt ears. Important Hint! Tacky glue is a must. Regular school glue will not work!